On 8 August 1914, the Royal Navy bombarded the German wireless relay station in Dar es Salaam. War had broken out in Europe just days earlier, and already it had come to East Africa. In the shadow of the horrors of western Europe, space in the popular memory for the East African theatre of the First World War is limited. Such room as there is tends to be dominated by Boys’ Own tales of derring-do, successes against the odds and heroic failures. The madcap British scheme to gain naval supremacy on Lake Tanganyika is Exhibit A. Two 40 foot motorboats, HMS Mimi and HMS Toutou, were shipped out to South Africa and transported 3,000 miles by land (including being dragged for 146 miles through the jungle of the Belgian Congo) to reach the lake. It should never have succeeded, and yet it did, capturing one German vessel and sinking another before forc­ing the Germans to scuttle their 220-foot flagship Graf von Götzen (now the MV Liemba). This inspired C.S. Forrester’s novel, The African Queen, a film of the same name starring Humphrey Bogart and Katherine Hepburn, and, more recently, Giles Foden’s book Mimi and Toutou Go Forth. Partly as a result, though the military significance of the Battle of Lake Tanganyika was negligible, the story became arguably the most well-known episode of the Great War in East Africa. Or perhaps that accolade should go to the sinking of the German battle-cruiser SMS Konigsberg. Just before outbreak of war, the ship had given the British navy the slip from Dar es Salaam harbour. She frustrated the British in the Indian Ocean for well over a year, sinking ships including City of Winchester and HMS Pegasus, before eventually being cornered and sunk in the Rufiji Delta. In November 1914, a British/ Indian Expeditionary Force launched a disastrous attack on the port of Tanga, the terminus of the strategically important Usambara railway to Moshi. There was an agreement that guaranteed the neutrality of Tanga, so the British gave the Germans 24-hours’ notice that the agreement was cancelled. Lettow-Vorbeck thus had time to bring reinforcements down the line from Moshi. When allied troops were landed, they struggled against a swarm of bees. The Germans faced similar problems, but they prevailed in what inevitably became known as the “Battle of the Bees”. These episodes have a place in the history of the Great War in East Africa. But they do not tell the full story – far from it – for this was a brutal war. 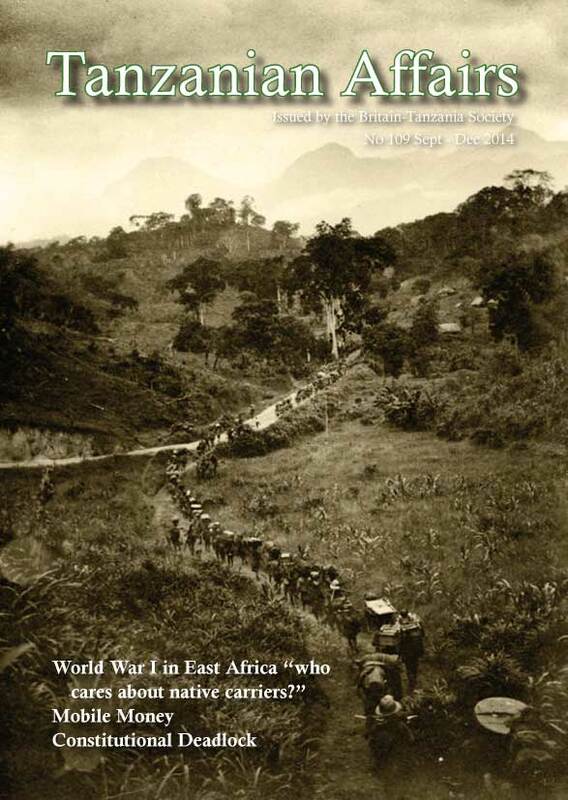 In contrast to the immobile trench warfare in western Europe, the war in East Africa was one of mobility and guerrilla tactics: brief battles and long marches. 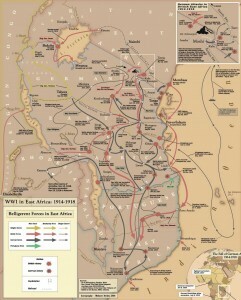 The allied troops launched an offensive in early 1916, after which Lettow-Vorbeck conducted a guerrilla war for two and a half years around the south of German East Africa (Tanzania), the northern part of Portuguese East Africa (Mozambique) and finally in Northern Rhodesia (Zambia). Lettow-Vorbeck by 1916 had around 20,000 troops – mostly Africans with German officers – while the allied combatants numbered around 150,000, under the command of South African General Jan Smuts. Smuts’ troops were drawn from Britain, the British colonies in East, West and Central Africa, South Africa, India and the Belgian Congo. 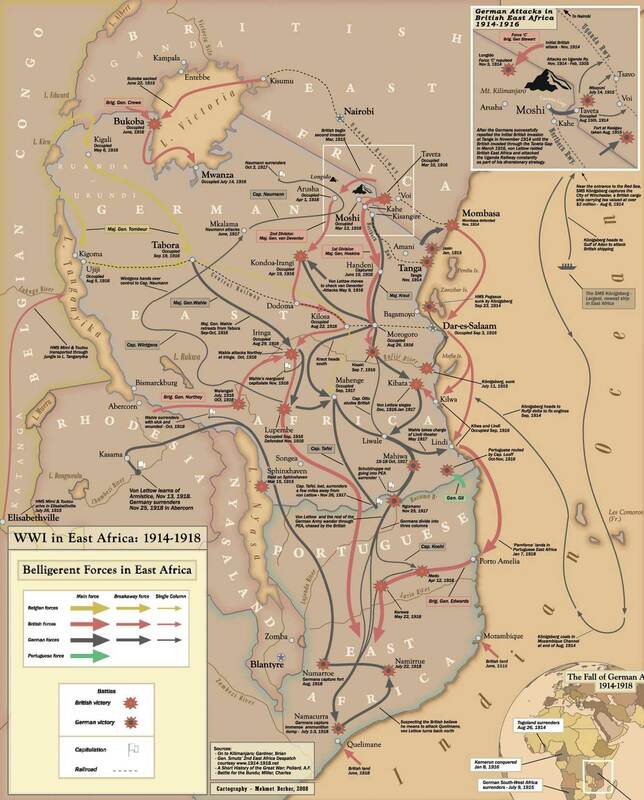 By the end of the war, the allied force was almost entirely African. In the words of one South African quartermaster, the war “involved having to fight nature in a mood that very few have experienced and will scarcely believe.” Another stated that “there is no form of warfare that requires so much inherent pluck in the individual as bush fighting.” And an officer who had fought on the Western Front wrote: “what wouldn’t one give for the food alone in France, for the clothing and equipment, and for the climate, wet or fine”. A Malawian veteran described the experience: “Think of lying on the ground where the hot sun is beating directly on your back; think of yourself buried in a hole with only your head and hands outside, holding a gun. Imagine yourself facing this situation for seven days, no food, no water, yet you don’t feel hungry; only death smelling all over the place. Listen to the sound from exploding bombs and machine guns, smoke all over and the vegetation burnt and of course deforested. Look at your relatives getting killed, crying and finally dead. These things we did, experienced and saw.” (Page, cited by Samson). The German troops largely abandoned efforts to maintain a supply chain, and instead appropriated crops and livestock without payment. They recruited some 300,000 carriers, again largely without payment. The effect of all this on the civilian population was devastating. Agriculture became more and more difficult, leading, by 1917-18 to famine in much of East Africa. There is no answer to these questions that can possibly justify the war. Lettow-Vorbeck saw the role of his army as a drain on allied resources – drawing men and weaponry away from more important battles in Europe. Though he evaded capture until the war had ended, at which point he surrendered in Northern Rhodesia, he never really drew significant manpower away from Europe. 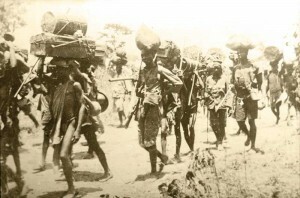 The allies fought the war mostly with African soldiers. 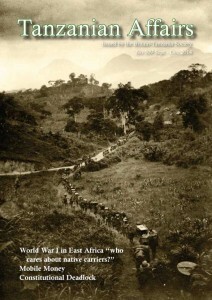 Historian Edward Paice sees the war in East Africa as “the final phase of the Scramble for Africa”, which “epitomised the vainglorious imperial ambitions which helped to trigger – and certainly prolonged – World War I”. The British gained a League of Nations Mandate over Tanganyika and the Belgians gained one for Rwanda and Burundi. But the war laid bare the human vulnerability of the white man as never before, and sowed seeds of a demand for independence. The First Pan-African Congress was held in Paris in 1919, to coincide with the Versailles Peace Conference. It called for Africa to be granted home rule, and for Africans to take part in governing their countries as fast as their development permits. In contrast to the (relative) glamour of a small British navy expeditionary force on Lake Tanganyika, the real story of the war in East Africa is far more brutal. The vast majority of war deaths were among carrier units – an estimated 95,000 on the allied side, probably well over 50,000 among the German carriers. Around one in eight of the adult male population of British East Africa – today’s Kenya – lost their lives either as askaris or carriers. 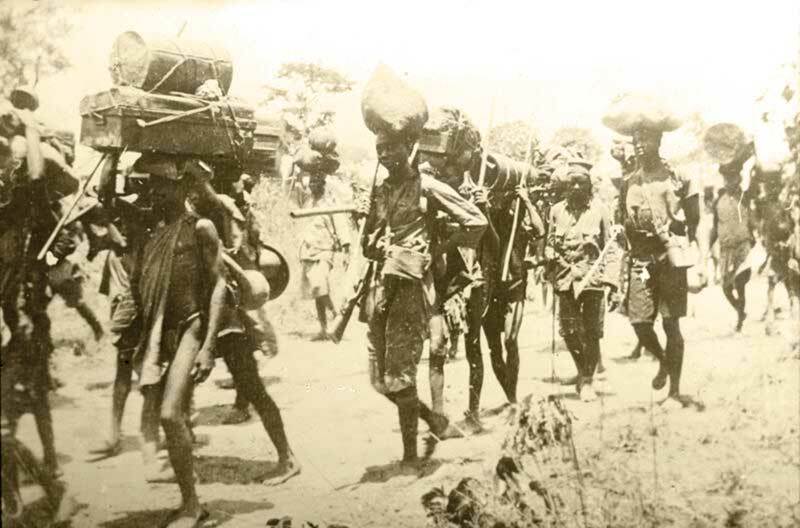 And an estimated 300,000 civilians in German East Africa died as a direct result of the war and the 1917-18 famine. The official death toll among British combatant and support units was over 105,000 men. This equalled the number of American war deaths, and was almost double the numbers of Australian, Canadian or Indian troops who lost their lives during the war. And yet, somehow, the worst was still to come. In September 1918, as the war was coming to an end, Spanish Flu reached sub-Saharan Africa. In British East Africa, probably as many as 200,000 died, nearly 10% of the total population of the country. In German East Africa, the death toll from Spanish Flu may have been as high as 20% of the population. “There came a darkness” is a much-repeated phrase in oral histories of the time. This was a war with an immense human cost: on the troops and on the carriers, and most of all, on the civilians. Anne Samson – The numbers game: how many men fought in Africa? Just an army of the Tropics and beginning to decay. We thought you had forgotten us-so long we’ve been away. And lots of us have lost the trail and crossed the Great Divide. And have never heard a “nine point five“ or a Hymn of Hate at morn. Or when you’re out on picquet hear a lion answer “Friend”? And then to bump a Maxim gun that’s dug in on the sky? And then go on fatigue all day in a heat that fairly bakes? And there was no change of rations; and our water bottles leak. And though the world forgot us we think we stood the test. Just an unremembered legion, fret with fever and decay. And all of us are weary, and lots have lost the way. And now we’re back amongst you, we’ll very soon get well. Just a Legion of the Lost Ones-who have wandered far away. Just a cohort from the northward, where we’d worse than Huns to face. But we’d ask you to remember – all our mates we left behind! Written by Owen Letcher in 1918 and first published in the Johannesburg “Star”. Letcher fought with the King’s African Rifles out of Nyasaland into German East Africa. He wrote an autobiographical novel about his experiences: “Cohort of the Tropics”. 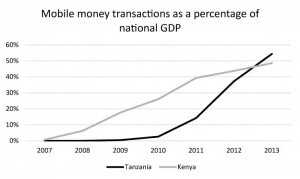 Mobile money has revolutionised financial services in East Africa, starting with M-Pesa in Kenya and spreading from there. 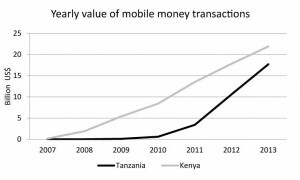 All Tanzania’s major mobile phone networks offer similar services, through which users can send money at very low cost to anyone in the country using a standard mobile phone. Two points are worth highlighting here. First, though Kenya was undoubtedly the trendsetter, Tanzania is fast catching up, and looks set to overtake Kenya during 2014. 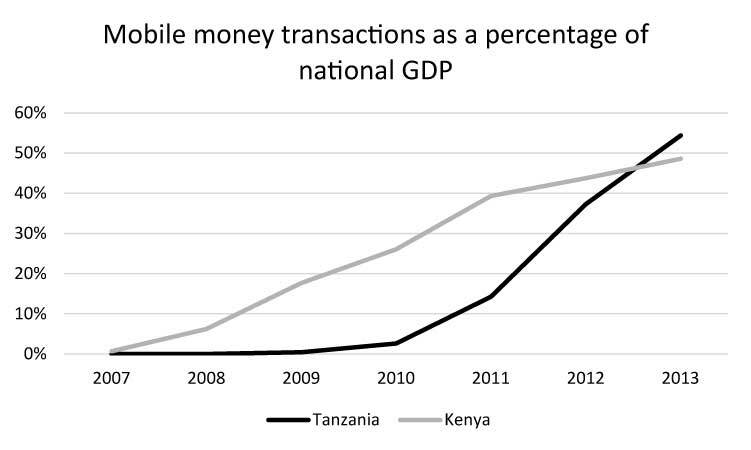 This raises the question: is Tanzania the first country in the world where mobile money transactions are worth more than half the country’s GDP? Quite possibly it is. As if Tanzania did not have enough political parties – there are twenty – there is now another one! This party, now going through the processes of official registration, bears the name; ‘The Alliance for Change and Transparency’ (ACT). It is believed that it has been set up by former members of the leading opposition party Chadema, which is the only party to have a chance of defeating the ruling CCM party in the 2015 elections. CCM has been in power for more than 50 years. ACT’s interim chairman said that the party would be guided by five principles – patriotism, equality, accountability, transparency and true democracy. The main opposition party Chadema, which did well in the 2010 elections, is now being torn apart by internal dissension. According to The Citizen, a group of its members have written to the Registrar of Political Parties on alleged illegal amendments to the party’s constitution, and to the Controller and Auditor General requesting an audit of the party’s accounts. Others have apparently accused the party of removing illegally a section on term limits for presidential candidates in Chadema’s constitution which could have made the party’s two main leaders ineligible for leadership posts’. Some observers think that these events are simply ‘business as usual’ in Tanzanian politics ahead of elections. Many of these members have defected before – mainly from CCM to Chadema or other smaller parties. Potentially more damaging is the revolt of perhaps Chadema’s most ambitious and charismatic former Deputy Secretary General, Zitto Kabwe, MP for Kigoma. Kabwe has been virtually expelled, together with other party members in the Kigoma and Tabora regions. He played an important role (see TA 108) in establishing the party’s growth, especially among the younger generation. In the case of CCM, too many people want to put themselves forward as candidates for the presidency. But the party has severely frowned on this premature campaigning and is threatening severe penalties for those engaged in it. All this is disheartening for those wanting Tanzania to develop into a democracy on the British model where governments change from time to time to reflect the changing views of the electorate. But most Tanzanians regard security and peace as their highest priorities. People continue to vote for CCM in large numbers because, unlike the situation in all its neighbours, Tanzania and CCM have given the country peace and a relatively good state of law and order. The present political scene, and especially the highly contentious debate on the constitution, could lead to stormy times in the next few months. With most politicians installed in Dodoma for the deliberations of the Constituent Assembly, the ruling party and the opposition parties have begun to worry seriously about the forthcoming 2015 elections. For the first time, three main opposition parties have come together in a ‘Coalition of the Peoples Constitution’ (UKAWA). Unless the CCM drops its determination to continue with two governments, Chadema has threatened to boycott further meetings of the Constituent Assembly (see separate article). Chadema goes much further in threatening not to take part in the 2015 elections under the current constitution because they claim (perhaps with some justification) that the present law favours the CCM. Chadema is concerned to ensure that the nearly six million new young voters will be correctly registered before the 2015 elections. It fears that the country could go to the polls before a new and fairer constitution comes into effect. It wants to see the setting up of a new; independent (of government) Electoral Commission which will not receive orders from any government authority and will have only members not belonging to any political party. It also points out that, although over 20 million people registered to vote in the last election in 2010, only 8.6 million actually voted. Municipal elections are due in October this year but the present National Electoral Commission says that it cannot afford to update the register twice between the two elections and is seeking funds to buy a biometric system with which to update the permanent voter register for both the constitutional referendum and the 2015 general election (but not for the local elections this year). Respected Tanzanian ‘elder statesman’ Salim Ahmed Salim, who is highly qualified for the presidency and reached the last stage of the presidential primary contest in 2005, has indicated that he no longer plans to stand for the presidency in 2015. He is believed to have been disillusioned by ‘political machinations’ at that time. He said that a good track record in leadership had not been enough to guarantee him victory. He is now 72 and says that younger blood should get the chance. What next for President Kikwete? President Kikwete has received much praise following his recent recognition by the African Leadership Magazine as Africa’s ‘Most impactful Leader of the year 2013’. In a rare interview with the press, the President told The East African that when he returned to private life he would look after his cattle and expand his pineapple farm. The Tanzanian government has released the amount of subsidy it paid, during a recent four-year period, to the political parties. The figures correspond to the strength of the party representation in the National Assembly and the Zanzibar House of Representatives. As in Britain, immigration is becoming a major political issue in Tanzania. Legislation is being considered for possible action on foreign workers. President Kikwete has said that the number of foreign workers has reached an “alarmingly high figure” and that a bill will be introduced in Parliament in October to limit the number of work permits issued to foreigners, even if they come from other parts of East Africa. The other members of the East African Community seem likely to oppose this. As the Tanzanian political scene gears up for the 2015 presidential and parliamentary elections, CCM remain in a strong position, despite a growing challenge from Chadema. But who exactly supports Chadema, and who backs CCM? It has often been assumed that Chadema draws most of its support from a young, urban demographic, while CCM retains strong support in rural areas, though there has been little information available to back this up. Recently released data from the Afrobarometer initiative, a continent-wide public opinion survey, allows us to examine this question in more detail. The survey asked the standard opinion poll question: If an election were held tomorrow, which party’s candidate would you vote for? 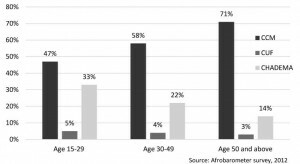 First, the survey found that support for Chadema was indeed substan­tially stronger among 15-29 year olds (at 33%) than the over 50s (14%). Conversely, support for CCM rises with age, from just under half the 15-29 year olds (47%), and nearly three in four of those over 50 (71%). Support for CUF and other parties was negligible. There is also a strong link between a voter’s level of education and their party affiliation. At each successive level of education, support for CCM dropped, and support for Chadema rose. Among those with post-secondary or university-level education, support for Chadema was higher than for CCM – 51% v 30% among university graduates. Support for CCM among less well-educated groups remains well ahead of Chadema. Among those with primary education, CCM has the support of a strong majority: 59% to Chadema’s 23%. Since those with primary education or below represent three quarters of all potential voters (8% have no formal education, 13% have some primary education and 58% have completed primary education), this suggests Chadema have a lot of work to do to bring less-well-educated voters to their side. Opinion poll data – a staple of political journalism across much of the world – have only very occasionally been available in Tanzania. The fast turn-around times of UK-style polls is simply not possible in Tanzania, where there is no easy way of quickly producing a random sample and few organisations have both the capacity and the credibility to carry out polls. However, two separate initiatives have begun to fill this gap. Twaweza [‘we can make it happen’] have set up a nationally representative sur­vey panel, reachable by mobile phone, and are now conducting twice-monthly public opinion surveys. This initiative is known as Sauti za Wananchi – Voices of the People. This dry season, tourist tales are of long day drives spent looking for elephant. Some find large groups clustered tightly; others are unlucky and return home without seeing one. It never used to be this way. Tanzania’s poaching epidemic is now much more than statistics: it is arguably a national disaster. At the end of April, Tanzania was named in the Born Free USA/C4ADS ‘List of Shame’ as one of the top countries in Africa with the worst poaching records and the least effective government action to control the worst threat to natural resources in living memory. Perhaps partly in response the growing international criticism of perceived governmental inaction to combat international poaching syndicates, the Tanzanian government hosted a Summit Conference to Stop Wildlife Crime and Advance Wildlife Conservation in May and signed a joint initiative with the United Nations Development Programme (UNDP) to establish a new body for wildlife conservation. On 10 May, The Daily News reported the creation of the Tanzania Wildlife Authority (TAWA), to increase the revenue derived from Tanzania’s natural resource and to intensify conservation. Let us hope the two are not mutually exclusive. The creation of TAWA was announced by the Minister for Natural Resources and Tourism, Lazaro Nyalandu, who assured delegates to the conference that there would be zero tolerance towards the corrupt and inefficient elements involved in the protection of the country’s wildlife. In particular, 500 extra game rangers are to be hired and three helicopters await pilots currently training in South Africa. Operation Tokomeza, the Tanzanian government’s attempt to combat poaching (see an article in TA108), continues to create headlines. In May, President Kikwete established an investigation into the Operation. Retired Justice Hamisi Msumi will head efforts to address the complaints of all those negatively affected by the Operation whilst also investigating claims that the Operation was sabotaged. Meanwhile, Tokomeza II continues, but without the early successes, or alleged excesses, of the original Operation. Putting to one side where the individual culpability lies for the dramatic loss of natural resources through poaching, The Citizen on 7 July draws on the international media to provide a clear explanation for the driving force behind the trade. It outlined how the price of African ivory in China has tripled over the past three years, so that the cost of ivory in China is now ten times the cost in Africa, a profit margin that is driving corruption, crime and conflict across Africa. The poaching epidemic in Tanzania must be confronted and stopped for the sake of the species targeted. Once they are gone, they will be extremely difficult to reintroduce. The continued existence of elephant and rhino has an existential value, but it also has an immense economic value – a fact should also be remembered by the Tanzanian government when considering other areas of legislation that affects the tourism industry. In June, in the run up to the release of the national budgets in East Africa, intense lobbying was carried out by the Tanzanian tourism industry with government officials to prevent, or adjust the timeline for, the repeal of certain VAT exemptions covering tourism goods and services that would have resulted in an increase to the average Tanzanian holiday package of about 10%. Whilst the impact of such a rise on the numbers of tourists visiting Tanzania in the medium to long term is debatable, the issue was that the change was due to come into effect on 1 July 2014, days after the deci­sion and at the start of the peak travel season. The potential increased costs would have to be passed on to clients, risking widespread cancellations and Tanzania’s good reputation in the African tourism market. The Tanzanian government of course has the right to determine its monetary policy as it wishes, but tourism operators were left pleading for some forewarning and an understanding of the realities of the ultra- competitive market that is African tourism. In the event, the decision was delayed until October, leaving the operators waiting. On 23 June eTN Global Travel Industry News reported that the East African Court of Justice had ruled against the Tanzanian government’s plans to construct a bitumen road across the Serengeti National Park, declaring it to be ‘unlawful’. Although celebrations broke out in court and across the internet, it should be noted that the ruling only specified a ‘bitumen road’, leaving open the prospect of a gravel road following the same route. So the battle goes on for the future of the Great Migration, the integrity of the Serengeti National Park and the reputation of Tanzania as a leader in the field of African conservation. Throughout March and April the Constitutional Assembly (CA), the body tasked to come up with a final draft Constitution, was marred by divisions between two informal coalition groups within the Assembly. “Tanzania Kwanza” is largely made up of CCM members; whilst “UKAWA” (Muungano wa Umoja wa kutetea Katiba ya Wananchi – Coalition of Defenders of the People’s Constitution) is formed mainly from members of the opposition parties. The arguing and political mud-slinging is focussed almost exclusively on one issue: the nature of the relationship between Zanzibar and main­land Tanzania – “the union question”. Should Tanzania continue with a two-government system (i.e. Tanzania and Zanzibar), or adopt a three-government structure (Tanzania, Zanzibar, Tanganyika), also referred to as a “federal” government? As the Constitutional Assembly’s first session broke up in April – to allow MPs to return to parliament for the annual budget session – UKAWA’s frustrations with CCM intransigence on the union question led them to walk out on the Assembly. UKAWA is thought to have considerable support among the Tanzanian public. In 2010, as part of their election manifestos, both Chadema and the Civic United Front (CUF) pushed for a three-tier government, which had previously been proposed by various groups and commissions over the past 30 years or so. The Constitutional Review Committee (CRC) took the initiative and incorporated this into both the first and second drafts of the proposed constitution, which according to Joseph Warioba, Chairman of the CRC, “was aimed at safeguarding the 1964 merger between Tanganyika and Zanzibar”. It has been argued by supporters of the three-government system that it streamlines the governmental structure and gives Zanzibar more autonomy, thus maintaining stability between mainland Tanzania and Zanzibar. Judge Warioba has gone on record several times to state that most Zanzibaris are in favour of the three-government idea, though this has been challenged by some Zanzibari politicians. President Kikwete has been vocal in his objection to the proposal; in his opening speech to the Constitutional Assembly, he stated that a three-government system will not add value and will create problems. CCM, which had previously housed a wide range of opinions on the matter, fell quickly into line behind the president. The delay in debating the draft constitution has had a knock on effect on new laws being drafted. Proposed energy legislation, for example, which could make Tanzania the first exporter of liquefied natural gas in East Africa, may now have to wait until next year. Changes to the law to ensure better rights for women, children, the disabled, the press, and many other vulnerable groups are likely to be enshrined in the new constitution if it goes ahead. The issue of dual citizenship has received attention from a few high ranking politicians who suggest that its inclusion will be debated in the Constitutional Assembly. However, it is believed that dual nationality is more likely to be incorporated within a separate Act of Parliament rather than within any new constitution. Bernard Membe, the Foreign Minister, told the National Assembly in May: ”We believe that the time is ripe for our country to have an Act that allows dual citizenship, in the interest of our nation’s development”. All these issues hang in the balance until the Assembly deadlock is broken. The United Nations Development Programme (UNDP) has also been closely monitoring the situation. In May UNDP Administrator Helen Clark criticised UKAWA for its walk out earlier in the year and urged that they voice their concerns and discontent through the forum of the Assembly, rather than refusing to participate. This has been echoed by Judge Warioba, warning that failure to reach an agreement may plunge the country into a political crisis. Kenyan politician and legal scholar Patrick Loch Otiendo Lumumba has been asked to mediate in the CA and ease the tensions between UKAWA and Tanzania Kwanza. The CA Chairman, Samuel Sitta, also sought to broker peace between the rival groups with a reconciliation meeting scheduled for 24 July. The UKAWA members did not show up, arguing that it was pointless as CCM continue to hold a firm line on the union question. Deus Kibamba, chairman of the influential civil society group, Tanzania Constitution Forum (TCF), has called for the debate over the new constitution to be delayed until after next year’s elections. There are many who believe that Tanzania will not get a new constitution because both groups will never reach a consensus. The debate on the Constitution is due to resume in August. The president has authorised a further extension of the time, allowing 60 days from 5 August for the CA to finalise the draft constitution before it can be presented to the public for a vote. At the time of writing, UKAWA continues to boycott the Assembly, though Sitta insists it will carry on regardless. This raises two questions: Will the CA have sufficient members present to vote on the articles of the new constitution – will it be quorate? Without UKAWA members, it looks to be very close. And if votes are possible, will a new constitution written by a CCM-dominated Assembly have sufficient popular legitimacy and support to pass a national referendum, and stand the test of time? It would be a bitter shame if it all collapses at this stage, wasting billions of shillings, years of preparation and most importantly, a golden oppor­tunity to address many of the fundamental problems that the country faces. An independent observer may be forgiven for reaching the con­clusion that Tanzanian politicians excel at forming coalition groups, but underperform in implementing objectives. The next few months will show whether such an observation is unfair. Three East African Community (EAC) member countries (Kenya, Rwanda and Uganda) continue to forge ahead in signing agreements and strengthening their relations, while Tanzania and Burundi, the other members, remain either absent from discussions or self-excluded because so many of the new development programmes do not directly concern their countries for geographical reasons. Examples include the dramatic fall in the clearance time for goods going from Mombasa to Kampala – down to 4 days compared with 12 days previously, and from 21 days to 6 for goods going from Mombasa to Kigali (Rwanda). There has been a substantial lowering of costs. This is the result of the East African Single Customs Territory (EASCT), which ministers from the three countries have recently signed. Under a new special visa deal, foreign residents can get a single six-month multiple entry visa for US $100 valid in all three countries (i.e. 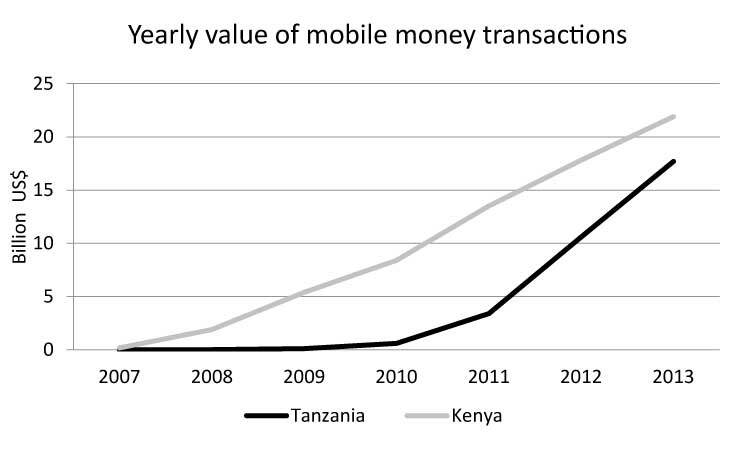 not including Tanzania). This compares with the earlier cost of $150. The three countries are also participating together in various international tourist fairs. From August 2014 the tax on mobile phone calls between the three countries is being reduced by 20%. Plans were being prepared for Tanzania to join in this. After the rough period in relations between Tanzania and Rwanda last year, relations seem to be slowly getting better again. Rwandan President Paul Kagame said he would readily honour an official invitation to visit Tanzania if he received one because Tanzania meant a lot to him, as did the survival of Rwanda and the stability of the region. Tanzania’s State House responded by saying that the idea was not only welcome but was also a critical step in normalising relations between the two countries. A recent UN report has claimed that that 18 military technicians from North Korea had been involved in the refurbishment and repair of Tanzanian F-7 fighter jets and other military aircraft at the its Air Force base in Mwanza. The journal Africa Confidential has reported that although N. Korea has no diplomatic representation in Tanzania, two senior officers had been seconded to the Tanzanian Peoples Defence Forces. The report said that Uganda, Ethiopia and Eritrea were also engaged in providing military assistance. Tanzania has strongly denied the allegations. “Tanzania has no trade relations with N Korea. UN sanctions are specific. They are about trade and we don’t have any trade deals with North Korea,” said a Foreign Affairs spokesman. He added however that maybe the TPDF may know more. North Korea is believed to have developed sophisticated ways to circumvent UN sanctions, including the suspected use of its embassies to facilitate an illegal trade in weapons, and making use of complicated financial techniques “pioneered by drug-trafficking organizations” , so that tracking the isolated state’s purchase of prohibited goods is more difficult. The 127 page report was compiled by a panel of eight UN experts and is part of an annual audit of North Korea’s compliance with UN sanctions imposed in response to Pyongyang’s banned nuclear weapons and missile programs. The panel reports to the UN Security Council. “From the incidents analyzed in the period under review, the panel has found that (North Korea) makes increasing use of multiple and tiered circumvention techniques,” a summary of the report said. In a wide ranging interview given by Chinese Ambassador Lu Youqing to the Hong Kong newspaper South China Post (quoted by the Citizen) he touched on some delicate parts of Chinese relations with Tanzania and Tanzanians. On corruption he said that in 2011 his country had made amendments to its criminal law so that it was now a criminal offence for Chinese nationals to bribe nationals in foreign countries. The Ambassador voiced his concern about “shoddy” work being carried out by some Chinese contractors in neighbouring countries and said that some infrastructure projects had been undertaken by Chinese companies at unrealistic prices. They had been building roads for between $300,000 and $400,000 per km but the real cost was much higher and he wondered what would happen to these roads in five years’ time. The Ambassador expressed his disappointment over “bad habits” that tarnished China’s image in Tanzania. For example he mentioned corruption and illegal ivory trading. “Our people just cannot shake off their bad habits. When they come to Africa, they are not united and engage in infighting as usual” he said. He referred to competition among Chinese companies over contracts and bribes offered to Tanzanian officials to lobby on their behalf. Dar es Salaam Stock Exchange (DSE) Chief Executive Moremi Marwa has said that the time has come for the municipalities intending to implement various economic projects to raise capital through stock market. The Capital Markets and Securities Authority (CMSA) initiated and supported the move and according to the Chief Executive officer of CMSA, Nasama Massinda, municipal bonds are soon to be a reality in three councils. The government through the assistance of the World Bank sponsored a two-phase municipal bonds study. The study brought to light the fact that the prevailing government policy would not support efficient issuing of bonds by Local Government Authorities (LGAs) for public subscription. The first phase of the project strived to establish the feasibility and required policy changes for a thriving municipal bonds market in Tanzania. The second phase was to develop the legal and operational framework for the municipal bond markets in the country. The Minister for Industry and Trade, Dr Abdallah Kigoda, called on the Chinese business community to build manufacturing industries in the country to mutually benefit both nations. The call was made at the launch of Brands of China African Showcase 2014. The event brought over 100 Chinese companies showcasing products. Products displayed range from machinery, vehicles, home appliances, electronics and solar energy products, consumer goods, building materials, chemical, medical and comprehensive products. Dr Kigoda said it is time for the Chinese nation to invest in the manufacturing sector which would add value to the country’s profile by reducing the exporting of raw materials which adversely affects the economy. “A great part of our exports are raw materials which after being processed outside, are then sold back to us. We are acting as a global supermarket for goods made from materials produced in our country,” said Dr Kigoda.